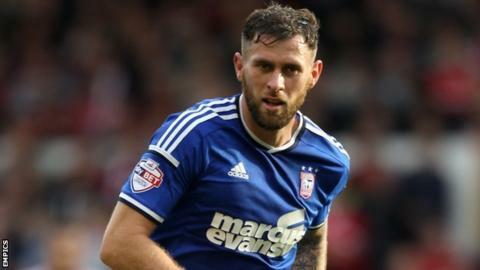 Two goals from Daryl Murphy helped Ipswich beat Brentford and keep hold of second place in the Championship table. Murphy put Town ahead inside the first 20 seconds, with a close-range finish following Paul Anderson's pass, before he rounded David Button for his second. Anderson added a third, converting a cross from former Bees winger Jay Tabb. Sam Saunders scored twice for Brentford - a deflected effort and a close-range strike - either side of Tommy Smith's calm finish, which secured the win. Brentford began the day in third but fell behind to Murphy's first goal, which, at 19 seconds, was the quickest in the Championship so far this season. This was the first league meeting between the two sides since a 1-1 draw at Griffin Park in the old Division Three in February 1957. Ipswich were on their way to extending their unbeaten league run to 10 games when Murphy, the Championship's top goalscorer with 16 league goals, grabbed his second of the match, before Anderson added a third soon after. The Bees, who had not lost any of their previous seven home matches, finally created some chances but Andre Gray's header was saved by Bartosz Bialkowski, who later denied Alan Judge. Brentford pulled a goal back with 10 minutes left when substitute Saunders's shot took a deflection off of a sliding Noel Hunt before looping over Bialkowski. But Ipswich, despite having less of the overall possession, immediately restored their three-goal advantage as Smith finished off from a corner. Brentford scored the final goal of the match when Saunders prodded the ball home after a scramble, but Mick McCarthy's side had done enough to take the three points. Ipswich boss Mick McCarthy: "If we get a bonkers offer for Daryl Murphy, it's beyond my control, but why would we sell our best players? "Brentford are a really good team and they were pressing to get back in the game, took chances and left Murph one on one, which is always a mistake." Brentford manager Mark Warburton: "To be three down at half-time against a side of that quality leaves you a mountain to climb, but we still looked to play and had some good passages of play. "There were three errors. We were hesitant and a little sloppy. I don't mind mistakes but we have to learn from them." Match ends, Brentford 2, Ipswich Town 4. Second Half ends, Brentford 2, Ipswich Town 4. Goal! Brentford 2, Ipswich Town 4. Sam Saunders (Brentford) right footed shot from very close range to the top left corner. Attempt blocked. Nick Proschwitz (Brentford) right footed shot from the centre of the box is blocked. Assisted by Jake Bidwell with a cross. Attempt missed. Jake Bidwell (Brentford) header from the centre of the box is high and wide to the left. Assisted by Sam Saunders with a cross following a corner. Attempt missed. Jake Bidwell (Brentford) left footed shot from the left side of the box is high and wide to the left following a set piece situation. Attempt blocked. Harlee Dean (Brentford) header from the centre of the box is blocked. Assisted by Jon-Miquel Toral with a cross. Attempt missed. Stephen Hunt (Ipswich Town) left footed shot from the centre of the box misses to the left. Assisted by Daryl Murphy. Goal! Brentford 1, Ipswich Town 4. Tommy Smith (Ipswich Town) right footed shot from the left side of the box to the bottom right corner. Assisted by David McGoldrick following a corner. Attempt saved. Tommy Smith (Ipswich Town) header from the centre of the box is saved in the centre of the goal. Assisted by Stephen Hunt with a cross. Corner, Ipswich Town. Conceded by Tony Craig. Goal! Brentford 1, Ipswich Town 3. Sam Saunders (Brentford) right footed shot from the left side of the box to the top right corner. Assisted by Harlee Dean. Jon-Miquel Toral (Brentford) wins a free kick in the attacking half. Substitution, Brentford. Sam Saunders replaces Alan Judge. Corner, Ipswich Town. Conceded by Moses Odubajo. Substitution, Ipswich Town. Stephen Hunt replaces Jay Tabb. Attempt missed. Daryl Murphy (Ipswich Town) left footed shot from the right side of the box misses to the left. Assisted by Luke Chambers. Attempt blocked. Alan Judge (Brentford) left footed shot from outside the box is blocked. Assisted by Moses Odubajo. Offside, Ipswich Town. Teddy Bishop tries a through ball, but David McGoldrick is caught offside. Attempt missed. Jota (Brentford) left footed shot from outside the box misses to the right. Assisted by Moses Odubajo. Substitution, Ipswich Town. Noel Hunt replaces Paul Anderson because of an injury. Substitution, Brentford. Jon-Miquel Toral replaces Jonathan Douglas. Tony Craig (Brentford) is shown the yellow card for a bad foul. Paul Anderson (Ipswich Town) wins a free kick in the attacking half. Attempt saved. Alan Judge (Brentford) left footed shot from outside the box is saved in the bottom right corner. Assisted by Andre Gray. Attempt saved. Jonathan Douglas (Brentford) header from the centre of the box is saved in the top centre of the goal. Assisted by Alan Judge with a cross.